Unbelievably, the summer has already drawn to a close. This means that the 15 undergraduate students chosen to undertake a BioCanRx-funded research internship in cancer immunotherapeutics have departed as well. We are so proud of the knowledge and growth our summer students have gained and we wish them all the best. Curious what these students were up to? We asked three of them to expand on their experiences. Meet Analyssa Cardenas, who worked with Drs. Dean Fergusson and Manoj Lalu at the University of Ottawa, Jaahnavi Dave, who worked with Denis-Claude Roy at the Université de Montréal, and Jianyin Liu who worked in Dr. David Evans’ lab at the University of Alberta. 1. Who are you? Where did you go to school? What’s your program? One fun fact about yourself! Analyssa: Hey! My name is Analyssa and I’m from Ottawa, Ontario. I finished my Bachelor of Science in Kinesiology from the University of Waterloo this past year and I’ll be starting my Master of Science in Rehabilitation Sciences at the University of Toronto this Fall. Specifically, I’ll be working at the Holland Bloorview Kids Rehabilitation hospital researching pediatric rehabilitation with in-patient children with cerebral palsy. When not studying or working, I love playing ultimate frisbee and traveling! During my undergrad I actually worked at a medical informatics start-up company in Amsterdam for 4 months and conducted biomechanics research in 3D printing in China for 4 months. 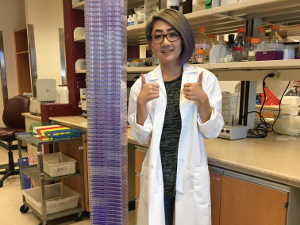 Jianyin: I’m Jianyin and I’m a fourth-year undergraduate student in Immunology and Infection with Specialization at the University of Alberta. Outside lab, I love skateboarding, driving out of town for spontaneous adventures and learning German! Jaahnavi: Hello! I am Jaahnavi, and I am currently in my final year of my bachelor’s degree at McGill university. I am excited to be majoring in microbiology and immunology. A fun fact about myself is that I love to make jewelry and recycle old clothes into new clothing projects! 2. Why did you want to do cancer research this summer? Analyssa: I wanted to do cancer research this summer because so many people, myself included, have been influenced by cancer in some way or form. Throughout my undergrad, I’ve always had a strong interest in medicine and human health, and having the opportunity to play a role in working towards improving treatment has truly been life changing. 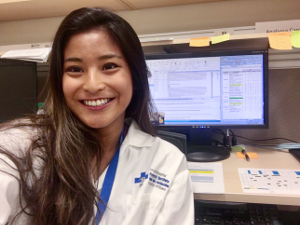 I’m passionate about working in healthcare and cancer research because no matter who you are, where you come from, or what differences may set you apart from someone else, basic health and quality of life is vital to everyone. Being able to see the difference you can make in someone’s life is truly rewarding. Jianyin: Cancer is something that always on the top chart of medical concerns and a hot topic at all times. My journey in cancer research started last year, where I studied on the genetic basis of cancer immunology, led me to be obsessed with this field and wanted to learn as much as I can. So, I worked on my passion this summer with more of a focus on the therapeutic side. 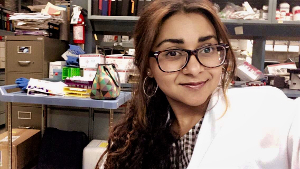 Jaahnavi: Last summer, I had the opportunity to conduct research in the field of cancer immunotherapy – specifically, the area of cellular therapy. This was a great learning experience and inspired me to further pursue cancer research. This field has evolved over the course of a few decades, and I find it immensely intriguing that scientists are now harnessing the power of our body’s own immune system to target cancerous cells. 3. What did you work on this summer? What did you discover? Analyssa: This summer I worked with a team of basic and clinical scientists with expertise in preclinical in vivo and oncology research, as well as qualitative research methodology. We were interested in learning about potential barriers and enablers to cancer and cardiovascular researchers’ application of the methods outlined by the National Institutes of Health (NIH) Principles and Guidelines to designing and reporting an in vivo preclinical study (i.e. using community based standards to help report the study, and during the study design phase, determining whether biological replicates or technical replicates will be used, determining the details of statistical analysis, randomization and blinding, calculating the sample size, and determining any a priori inclusion/exclusion criteria). We’re still in the very early stages of analysis, but a few preliminary findings include that most researchers are motivated to apply the methods outlined by the NIH, and see their implementation as beneficial to improving the strength of the data, and reproducibility and translation of preclinical research. We also identified that access to additional resources (i.e. financial, statistical support, personnel) may enable application of these guidelines. Based on our preliminary results it also appears there is interest in attending a workshop or online platform of educational resources for experimental design and reporting. Our interviews have helped to identify several important topics that could be addressed at this workshop (i.e. methods for randomization and blinding). Completion of more interviews and full analysis of the results will further help to inform the design of a workshop and online resources for preclinical researchers. Jianyin: This summer, I had the great opportunity to work in Dr. David Evans and Dr. Mary Hitt’s labs to investigate on the treatment ofBacillus Calmette-Guérin (BCG)-resistant non-muscle invasive bladder cancer with oncolytic vaccinia virus. We found that an inhibitor that blocks BCG uptake into bladder cancer cells does not completely block uptake of oncolytic vaccinia virus uptake. Jaahnavi: Allogeneic hematopoietic cell transplant is a treatment method for chemo-refractory cancer patients, due to T cells targeting minor histocompatibility antigens (MiHAs) expressed on cancer cells. However, patients can develop graft versus host disease when alloreactive T cells attack host tissue. This summer, my project combined the ex vivo expansion of MiHA specific T cells with photodynamic therapy to eliminate alloreactive T cells, while testing a novel expansion protocol. We found PDT successfully eliminates alloreactive T cells and preserves MiHA specific T cells. These results are promising for developing a new immunotherapeutic approach. 4. What was one memorable moment from this past summer during your studentship? Analyssa: One of my most memorable moments from this past summer was getting to bond and learn from my coworkers and fellow students from my research group, known as the Blueprint Translational Research Team. Every week the Blueprint Team hosts a student session, in which one of the staff members discusses a specific research topic with the students. I really enjoyed the opportunity to have one-on-one sessions in a less formal setting and learn from the people around me. Of course, I’m also looking forward to the Summit4CI Conference this October in beautiful Banff! Jianyin: There’s no exact one memorable moment because every single moment during the studentship is memorable! This might sound too corny but every day I was amazed by how much people in the lab dedicated to their work and I appreciate all their help. It’s the little things that matters. Jaahnavi: The past summer has been quite memorable in many ways. I formed some great friendships with my colleagues, and while enjoying science, our days were full of jokes and discussions. I also enjoyed working in a hospital setting, as I was able to shadow my supervisor – a doctor – which provided great insight into what the career of a doctor entails. I also really enjoyed presenting my research project at the annual summer student day organized by the hospital’s research center. 5. How did this research experience impact your career development? Analyssa: This research experience impacted my career development by providing me with the skillset and tools to help me succeed with my graduate studies. Working with a collaborative team of both preclinical and clinical scientists, as well as oncologists, has shown me how important each step of the research process is in achieving a common goal, better cancer treatment. By spending the summer understanding the different barriers and facilitators to implementing rigorous experimental design, I will now take this experience and ensure that I apply the best rigour I can in my own research. Having the opportunity to work on such a unique research project makes me even more excited to pursue my graduate degree and further my education. Jianyin: This experience brought me insight of the development of therapeutic interventions of cancer treatment and it takes many people’s hard work and dedication to improve the treatment/care for cancer patients. I learned lots of the techniques regarding to oncolytic viruses and I know firmly that cancer research is something that I would like to keep in mind as a career option. Jaahnavi: This research experience has encouraged me to pursue a career as a physician. I especially interested by the merging of the scientific process with the social components of a hospital setting, something I was fortunate to experience first-hand when shadowing my supervisor in the clinic. 6. What is your hope for cancer treatment/care in the future? Analyssa: My hope for cancer treatment and care in the future is that eventually everyone will have access to better treatment and higher quality of life. I also hope that with time the design and reporting of preclinical in vivo experiments will improve, and that this will ultimately lead to better reproducibility. By ensuring rigorous design and analysis of experiments, this will help to decrease bias and increase the likelihood of identifying cause-effect relationships between therapies and disease response. Ultimately down the line, my hope is that this will improve the selection of therapies that are most likely to benefit patients. Jianyin: There are huge potentials for cancer treatment/care. With all the hard work and effort of cancer researchers and physicians across the globe, I am confident that more and more cutting-edge cancer therapies ad care is to come in the near future. Jaahnavi: Cancer is a disease which exists in multiple forms and can affect any part of the body. Not only is it difficult for the patient- it also impacts the lives of family and friends. I believe that cancer immunotherapy is an extremely promising method of treatment, as it is already used to treat many types of cancers. I also hope that as technology advances, screening procedures will become more effective, and hopefully more affordable.